Sunday! 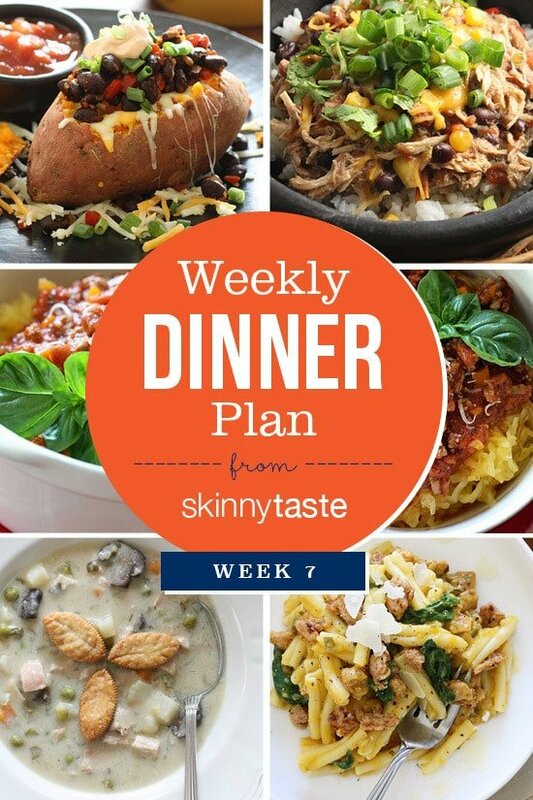 This is week seven (7) of sharing my weekly dinner plans since launching The Skinnytaste Meal Planner. I’ve had such positive feedback from all of you that I will be doing this every Sunday. A few things I would love to talk about first, if you follow Skinnytaste on Facebook, you may not be seeing my posts thanks to Facebook’s algorithm changes. Basically, they want me to pay for you to see what I post. So to be sure you never miss a new recipe, please sign up for my free email or follow me on Instagram (or both)! I mentioned last week I started tracking my points on Weight Watchers again and it’s been going great. They’ve invited me to be a part of something very special but it’s all top secret so I can’t talk about it yet… but all good things are coming soon! This makes a lot, I will freeze the extra for another night. Made the Crock Pot Santa Fe Chicken for last night's dinner. It is so good. Cool! I'm a Weight Watcher and I've recommended this website many times at my meetings. Can't wait to see what you'll be doing. Gina – this looks great! 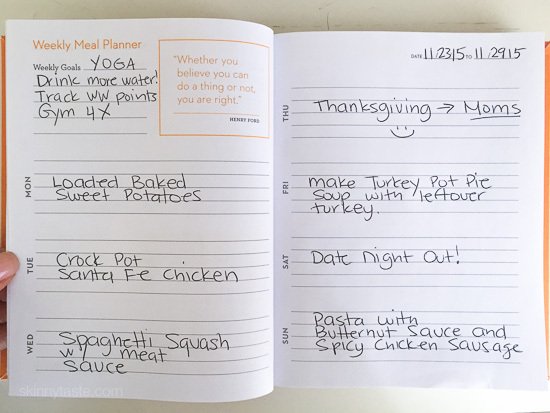 It is usually so hard to meal plan around a big holiday such as Thanksgiving so I really appreciate your use of leftovers the next day. 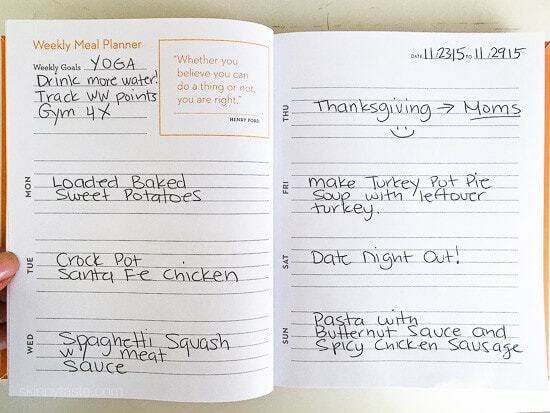 How much of your meals do you prepare in advance? Wonderful, because I am home I don't often prepare in advance, but when I am going out of town I make a few meals on weekends for the family to heat up. Gina, I love the weekly plans. Sometimes I can only make 1 or 2 of the items on your weekly plan, but I love that you introduce me to recipes I wouldn't have picked out myself. For example, tonight I made the pasta with butternut sauce and spicy sausage. It was truly decadent and rich, but was so fast and easy without lots of ingedients! Gina, This is fantastic! Thank you so very much! What are your typical breakfasts and lunches? Lately I'm on a smoothie kick or hard boiled eggs. Lunch is usually leftovers or something new I am creating. I love your crockpot meals! I mention your recipes at my WW meeting. Hopefully, they're going to get onboard with you! !